What is STEAM all about for our youngest learners? 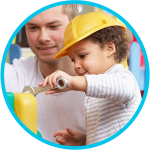 Providers will learn to recognize what STEAM concepts look like in developmentally appropriate learning experiences for infants and toddlers. Participants will also review the role of the provider in facilitating these experiences in infant toddler environments with materials that stimulate children’s natural motivation to explore and discover. Participants will also engage in hands-on, interactive activities and discover ways to apply STEAM concepts to everyday caregiving through best practices.